When I originally heard about Armello, I missed heard the title and thought my friend had said Carmelo, and my imagination took off imagining it was either a third person action adventure game, where you played as a chocolate covered caramel candy bar or a life simulator about Carmelo Anthony. After a few hours with the game, I would come to find out Armello was neither, but I would walk away having enjoyed my time. 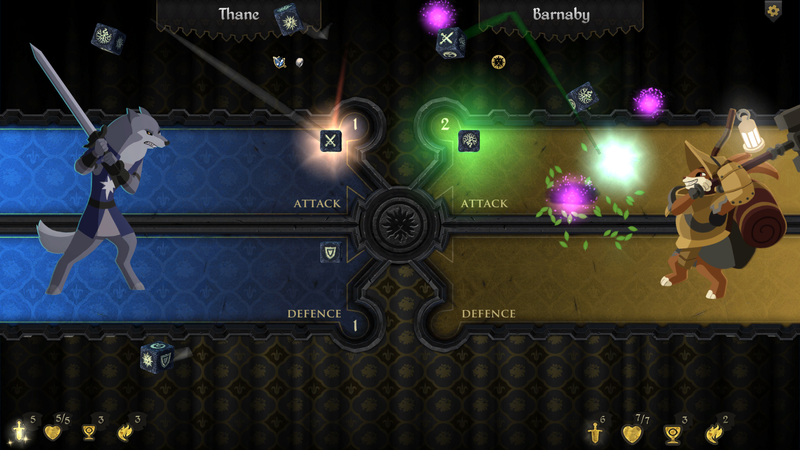 Armello is a turn based strategy board game developed by League of Geeks. The world of Armello is a mixture of Game of Thrones meets Disney anthropomorphic characters, with a striking art style, that at points, reminded me of The Banner Saga. The world of Armello is in trouble, the Rot, a malevolent force of evil, has spread and infected the King. It is now up to the the Wolf, Rat, Bear and Rabbit clans to take action. You are able to pick a hero from one of these clans, attempt to take the throne and possibly rescue the Kingdom, via one of four victory conditions. Rot – Increase your Rot score, so that it is higher than the King’s, and then slay him in battle. Spirit Stone – collect four spirit stones, which will allow you to banish the King without fighting him. Prestige – Gain Prestige from different acts and when the King dies, you will inherit the throne. Also if the King and aggressor both die during a Rot or Combat victory attempt, the Prestige leader will win by default. No matter what path to victory you attempt, you need to be aware that you are fighting on multiple fronts. You will face challenges from both the environment and from the 3 other players (either CPU or Human) but that is not all, because the Rot is killing the King. The King’s death acts as a timer, forcing you to take risks, so that you can gather enough prestige or equipment or whatever implements you will need to achieve your chosen victory. You do this by exploring the different types of tiles that the board is made up of, some will heal you, others will hurt you, and some will hide you from enemies, while others will give you money or items. But be aware, that you will face Royal Guards, Mercenaries or even spawns of the Rot during you adventures, and death will impact your prestige and Rot scores, while also sending you back to your starting area, one of the four corners of the board. But all is not lost, before death you are given a chance to fight by entering into a dice game, where you will roll several six-sided dice, the total number of dice equaling your attack value. The number of dice and their function can be modified by you equipment, allowing for dice to be assigned static values of attack, or block prior to rolling. Once the static dice are set, all remaining dice are rolled and their values are added to their respective groups of attack, block or discard. You will then attack your opponent, equal to your total number of attack die, trying to whittle down their defenses before landing damaging blows. Even if the opponent is dealt a killing blow, they will be allowed to perform their attacks, before death is accounted for, meaning both participants can end up dead when all of the dice are counted. You will repeat this turn based cycle of exploring, gathering items, and fighting, until either the King dies or one of the players successfully completes a victory condition. In your quest to save Armello, you will need to make sure that your path ultimately leads to the center of the board, the Palace. This is where you will faceoff with the King to possibly decide the fate of the kingdom and her citizens. 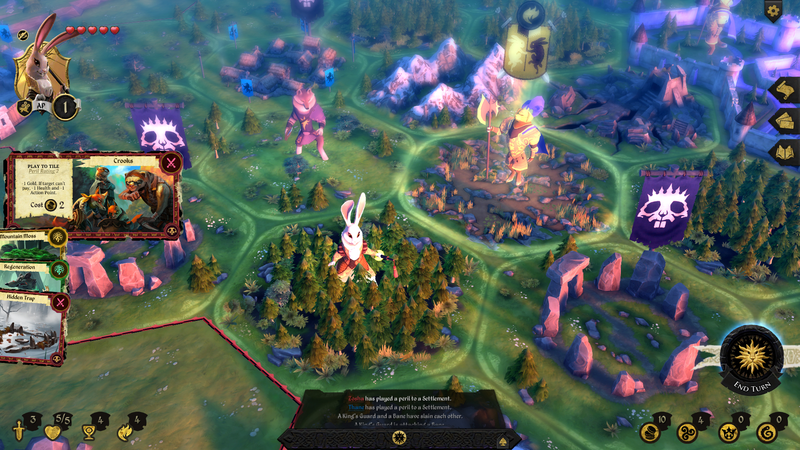 My time with Armello was enjoyable. The art of the world, equipment, and characters is spectacular. It very much embraces the idea of a unified artstyle, over a more realistic look, which gives the game a beautify quality, that I imagine will age well and allows it to be rendered on multiple platforms. The music is another high point, it is paired well with the setting and aesthetic, while being ambient, so as not to take you out of the setting. The gameplay is complicated but after playing through the tutorial prologues you will understand the basics of the world, and as you play more, you will unlock new equipment and character buffs that will enhance your hero. That is not to say it can’t be frustrating at times, but ultimately these frustrations lie with the player not having paid close enough attention to the systems, then with the game itself. It is a game that is easy to learn, but difficult to master. My biggest complaint is that there was no way to speed up the actions taken by the CPU players in the single player. While I understand this helps simulate the speed of a multiplayer game, and there is value in observing the actions of your opponents, it did slow play down and ended up encouraging me to reach for my phone to check Twitter or Facebook (editor’s note: maybe this in a comment on your attention span Tiny). We saw a similar issue with Codename S.T.E.A.M from Nintendo, and hopefully a similar resolution, which allows for players to speed up CPU actions, will be added. Ultimately, I would definitely recommend Armello. It is available for $19.99 on either Steam (Win/Mac/Lnx) or the Playstation 4. There is a forth coming IOS and Android version that will most definitely be tempting, since this is a game I can see myself playing when I have a couple minutes of downtime, but at the time of this writing, these ports still have no official release dates.